Kids aged 6~18 (Elementary school through high school) are eligible to join the workshops which will be held in both English and Japanese. Kids will have the chance to improve their singing, dancing and performance skills as make new friends, build confidence, have a wonderfully fun international experience. Before coming on this “International Music Outreach Tour” which takes them across Europe, North America, Australia and Japan; the young americans spend one year in preparation: studying performance arts as well as learning how to teach kids to sing, dance, express themselves and to encourage them to have fun performing. They study music theory, voice, chorus, dance and other performance arts. They also learn how to work effectively with young people to motivate and inspire them. Most years in June starting on a Friday night for a few hours after school (5-8pm) then on Saturday from 10:30-19:00 and Sunday from 10:00-20:00. The final performance is held on Sunday from 5-7 pm when all the kids and the Young Americans will do a joint performance together open to the public (advance tickets will be sold, all seats are ¥1,000). Participation Fee: ¥16,000 per child to take part in the workshops and you will receive 1 complementary ticket for the final performance for each child registered (child participants have their own seating area for the performance). Additional tickets for family are around ¥1,000 each. You can also sit in the audience and watch the workshops while it is happening on stage if you are interested – this was quite interesting and fun! You can take pictures and video during the practice sessions, but not during the final performance. You can now sign your child up and sign-ups will be open until the workshop is filled. To sign up in English, send a blank e-mail (both subject and content blank) to [email protected] and you will be sent a link to the registration page in English. Once you register, you will then be asked to pay at Lawson (or Family Mart) convenience store within the following 10 days. I wrote about the experience here in detail last year, it was a great experience for our kid. 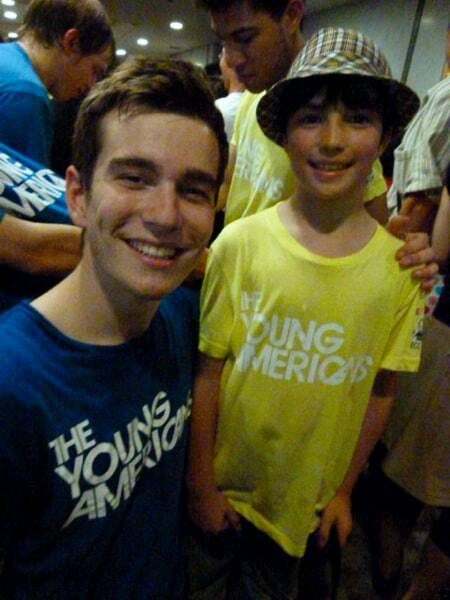 He was quite shy at first, but the Young American cast were so enthusiastic and great with all the kids. It is truly amazing how much they can teach and what great experiences the kids have in only a short time. I would highly recommend it to any families of school-age kids, even if your kid isn’t that “into” singing or dancing, it’s still a great experience. Home Stay: You can also volunteer to be a home stay family for some of the members of the Young American cast who will be working with the kids in the workshops. There will be information sessions held if you are interested in hearing more about the upcoming workshops, becoming a volunteer or offering a home stay to one or two of the American performers. If you are interested in volunteering or offering a homestay to one of the American cast (who are running the workshops), contact : Jackie Ikegami [email protected]ail.com or 09078909464 (English or Japanese) for more details. We provided a home stay for 2 Young Americans last year. As a host family, you will be expected to provide transportation to and from the workshop each day (earlier than your children will go). You should also provide breakfast, (pack a lunch) and have dinner ready when they get home each day. It was a great experience to do a home stay last year and we are volunteering again this year, but you do need to budget and plan for it. In our case, it worked out around 5,000 yen extra per home stay member for the 2+ day workshop period. You will need to wait about an hour after your child is finished with the workshop to take the home stays back as they have extra meetings at the end of each day (I drove kids home first then came back for them later or provided taxi fare and an address in Japanese for the taxi driver). Even though it is a little bit of a hassle, the most positive part of offering a home stay is it’s a great chance for you and your kids to get to know the YAs on a more personal level. They are really fun, interesting people- great role models for your kids. They are also able to connect with your kid more during the workshop as they are sharing their home with them. However, be prepared to give them privacy as well as they don’t actually have much time at your home and when they are there, they are (understandably) really tired from the tour. We found that on most days they didn’t want to chat much, they just want to shower, eat, relax and check their e-mails and Facebook to catch up with their friends and family back home. We made sure there was lots of food around for them to help themselves to, gave them a private room and left it to them to decide when and how much time to spend with us. If you accept that, you’ll have a great experience. They are so well mannered and were so positive and easy to have around and we certainly didn’t have to plan any extra activities for them- so in that way it was very easy to home stay to do.